In our opinion, any company that hires Continental Enterprises qualifies for their own space in The Tabberone Trademark & Copyright Abusers' Hall Of Shame. Simply put, any company that is stupid enough to hire Continental Enterprises, who in our opinion is the number one trademark extortionist out there, is too stupid to survive. Call it, "Tabberone's Theory of Corporate Extinction". Basically, stated as a formula, this theory is: stupid management = stupid decisions = can you say bankruptcy court? As a general rule we make it a practice to try and avoid antagonizing anyone who is allowed to carry a gun and to shoot people. It would be logical to extend this policy to those who make guns, just to play it safe. However, we have never been accused of being logical so why start now? In December 2008, it was first brought to our attention that Heckler & Koch had joined the unsavory ranks of brain-dead businesses that had employed Continental Enterprises to troll the internet to do their dirty business. As the entertainment rag Variety might say, H&K Hires CE To Diddle Suckers. We added Heckler & Koch to the CE list of clients after receiving a copy of another Darlene Seymour signed generic format letter where she makes her usual sweeping assertions about trademark law, her usual vague assertions about the alleged infringement and closing with her usual extortion demands. We didn't feel we had enough to give Heckler & Koch their own page until now. And it appears that Heckler & Koch, through their bottom feeder Cyber Cop, Continental Enterprises, has gone on a feeding frenzy, suing everybody and their brother. They are going to have some real problems with this approach. Besides bad judgment and bad publicity, they will lose any court fight. First, they have known for years other companies have been making "replicas" for toys and paint ball use. Failure to prosecute in a timely manner is called "acquiescence" and that's what they are faced with here. Second, they will lose on trade dress. Their designs may be theirs originally but they must then acquire distinctiveness recognized by the public to have trade dress protection. Mere functionality does not qualify for trade dress protection. Monday, December 22, 2008, Heckler & Koch sues Gamo USA, Inc. dba Aftermath Airsoft, case #1:08-cv-01707, Indiana Southern District Court. It appears dummy Darlene Seymour, General Counsel for Continental Enterprises, originally filed this case in Hamilton County Superior Court. We have pointed out that this is a very stupid maneuver on her part. Federal trademark issues cannot be heard in state courts. She is either incredibly stupid or very ethically bankrupt. We think both. Gamo USA had the case removed to federal court. Exhibit A for case #4:09-cv-0059, threatening letter. Exhibit B for case #4:09-cv-0059, proof of extortion, etc. This article was posted by Ryan Gile who calls his web site blog, Las Vegas Trademark Attorney. In this article, Ryan Gile twice linked to this web site as references. One for the Continental Enterprises page and once to the "What To Do If Contacted By Continental Enterprises" page. A twofer for Tabber. Seems that a web site, GunBroker.com, received a cease and desist letter from Continental Enterprises and refused to pay the extortion demand. GunBroker.com decided not to wait to see what the wild and wacky Darlene Seymour would do and filed a complaint seeking a declaratory judgment on May 14, 2009. To see the entire complaint (8 pages in pdf format), click here. We have also downloaded the two exhibits filed with the complaint. To see Exhibit A (19 pages in pdf format), click here. To see Exhibit B (14 pages in pdf format), click here. Parts of Exhibit B were taken directly from information posted on this web site about Continental Enterprises. What we wonder about is the court standard that a cease and desist letter cannot be the basis of a lawsuit. Virtually every court has held that the recipient of a cease and desist demand cannot use that letter as the grounds to initiate a civil action. It will be interesting to see if Heckler & Koch is willing to fight the issues or if they will file a motion to dismiss citing the lack of jurisdiction based upon the cease and desist letter. We think they will take the cowardly route and either settle or seek to have the case dismissed. If they do seek dismissal, we will suggest they change their corporate color from red to yellow. Continental Enterprises is making the ridiculous claim that the Heckler & Koch weapon design is famous and therefore any copy violated trade dress. For those who were in the military, the good old Colt .45 is distinctive, or the M-16 rifle, and for the old fogies, the M-1. But Heckler & Koch? They are distinctive only to the niche group of users and that just doesn't qualify under federal court definitions for trade dress. The trademark owner has the burden of proving the claim of trade dress infringement and the courts have a high standard for it for good reason. Heckler & Koch, through their sorry-assed cyber cop, Continental Enterprises, is shooting blanks. Darlene Seymour is just making another threat to collect her blood money. The logical and unanswered question here is why doesn't Heckler & Koch go after the gun manufacturers on this issue if it is so important? Because the issue really is mo' money, mo' money, mo' money in the pockets of Continental Enterprises and Heckler & Koch. Plus, we believe Darlene Seymour has to get her broom refurbished after 50,000 cackles so she is stirring the cauldron for more victims. Continental makes its money by helping schools recoup a percentage of unauthorized sales. If a company is selling an unlicensed North Central product, and Continental negotiates a settlement, Continental will get a cut, Quandt said. Continental also could get a cut of overall sales in some cases. "There really is no risk to the schools," said Continental Vice President Jeremiah Pastrick. "There's no upfront payment." This information came from Manders and Pastrick. It flatly states that Continental Enterprises is nothing more than a bounty hunter. They get paid by the head. That is not financial incentive? John M. Bowler of the law firm Troutman Sanders in Atlanta Georgia lied. But then, he is a corporate lawyer: a professional liar. UPDATE January 21, 2012 - GunBroker.com and H&K settled but that has not stopped the Wicked Witch of the West from continuing her extortion trolling. We wonder what was in the settlement because as of this date GunBroker.com is still offering items using the wording "in HK MP5 Style" for items that are not H&K. (Source http://www.gunbroker.com/Auction/ViewItem.aspx?Item=269475348 and http://www.gunbroker.com/Auction/ViewItem.aspx?Item=270052419). So it would appear that H&K backed off their demands about the wording. We wonder if Darlene Symour ever saw her reflection in the mirror would she melt as in the movie? 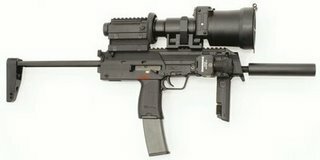 FYI - GunBroker.com is still listing articles for sale referring to them as "H&K like", etc. Seems H&K settled in favor of GunBroker.com on the issues rather than fight the good fight. As Ralph Kramden would say, "Hardy Har-har." We predicted this outcome.